(Nanowerk Spotlight) Magnetism is a fundamental property of materials because it derives from the motion of electrons in an atom and the subsequent alignment of several of these motions in a material. In that context, altering a material's magnetism has crucial implications. For more than 5000 years, noble metals have been known to be impervious to magnetic fields. Significant scientific breakthroughs in the recent past have led to making either 13 atoms clusters of platinum or organic molecule capped noble metal nanoparticles magnetic (see for instance: "Synthesis of Ultrathin Palladium and Platinum Nanowires and a Study of Their Magnetic Properties"). By carefully controlling the size, shape, and composition of noble metals – especially in confined nanoscale systems – their properties can be modified, potentially leading to significantly advanced nanomaterial-based applications such as catalysis, self-assembly, novel metamaterials, improved MRI research, and spintronics. "Despite the relatively high magnetic moments achieved already, these applications will require considerable amounts of magnetic material, hence there is a great demand for simple synthesis routes," Ger Koper, an associate professor in the Department of Chemical Engineering at TU Delft, tells Nanowerk. A recent paper in Langmuir ("Synthesis of Magnetic Noble Metal (Nano)Particles"), first-authored by Krishna Kowlgi, a doctoral student in TU Delft's Department of Chemical Engineering, describes the successful development of a simple method to make nano- and macro-particles of noble metals magnetic. Kowlgi, who conducts this research as a part of his PhD thesis, recounts that the fabrication process was actually discovered by coincidence during the standard production of nanoparticles of noble metals, which are needed for fuel cell research, among other things. "If the conventional method of making these nanoparticles is carried out in a strong magnetic field, it turns out that the nanoparticles, or clusters of nanoparticles, actually become magnetic themselves," he says. "The apparatus and reagents needed for making magnetic noble metals are so trivial that any decently equipped scientific laboratory should be able to reproduce our results." The process developed at the TU Delft is different from previous approaches in the aspects that the size of particles is not limited – magnetic nano- and millimeter sized particles can be made – and that capping agents are not necessary. By excluding the possibility that the magnetism identified is actually caused by impurities in the particles the researchers have proven that intrinsic magnetism can be invoked in noble metals, some of which are even close to satisfying Stoner's criterion for ferromagnetism. The team's preparation methods involve the reduction of noble metal precursors with a reducing agent under standard conditions. The complete reaction can proceed in a single vessel at room temperature. The only difference from the standard procedures is the application of a magnetic field. The video shows the synthesis of magnetic (nano)particle clusters of platinum. This process also applies to gold, silver and copper. "We have applied this magnetic field by means of permanent magnets of varying strengths" explains Kowlgi. "Stronger fields yield more ferromagnetic particles whereas the absence of a magnetic field yields no magnetic particles. In addition to ferromagnetic particles, our synthesis method also yields (strongly) diamagnetic particles." On area where magnetic nanoparticles are of particular interest is in certain medical applications. For example, tiny magnetic particles are used in contrast agents for MRI scans, but these have the disadvantage of being toxic to the human body. Silver and gold do not have this disadvantage and their surface can be functionalized to bind to specific targets and increase the contrasting efficiency. Koper concedes that concrete applications for this discovery are still far off. Further upscaling of production will be a significant challenge, but he believes that the challenge is not technically insurmountable. 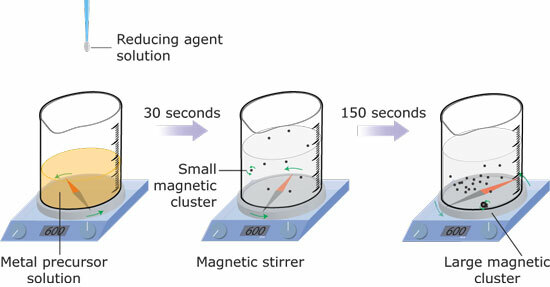 Although the main aim of the publication is to show that magnetic nanoparticles of noble metals can be produced in a simple manner, it is not yet completely clear why the particles become magnetic. Measurements conducted by the researchers however show that the effect is related to the presence of irregularities on the surface of the particles.